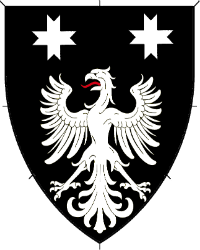 Sable, an eagle and in chief two crosses swallowtailed argent. Name registered with the College of Arms in September 2016. Device registered with the College of Arms in September 2016.